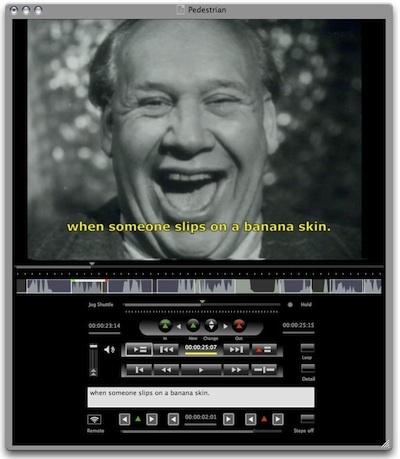 Gives you a sophisticated interface to attribute and subtitle video or audio. * Use any video format that QuickTime supports. * Read native native time-code media offset. * Support of Apple Remote Control for fast logging. * Support of Contour Design Shuttle Products. * Integrates standard QuickTime 1:1, 4:3 and 16:9 files seamlessly. * Waveform time-line for visual response and editing. * Fast logging of transcripts with dutation based on words per minute. * Final Cut Pro HDTV support. * Adobe Flash CS3 caption export (Example here). * JW FLV Player caption export (Example here). * Use Apple Motion 3 templates for rendering text in Final Cut Pro 6. * SCC closed captions are coming back to the Mac, at least to an affordable price and enclosed into an attractive application. * Export closed captions (SCC) for use with Apple Compressor and QuickTime. (Example here and here). * Export SubStation (SSA) open subtitles for use with Perian Example here. A very powerfull and simple to use hexadecimal editor. Qweas is providing links to Annotation Edit For Mac 1.8.9.4 as a courtesy, and makes no representations regarding Annotation Edit For Mac or any other applications or any information related thereto. Any questions, complaints or claims regarding this application Annotation Edit For Mac 1.8.9.4 must be directed to the appropriate software vendor. You may click the publisher link of Annotation Edit For Mac on the top of this page to get more details about the vendor.